Leupold 53436, 53434 Competition Series 40x45mm Riflescope FREE SHIPPING! Leupold's Competition line of riflescopes are designed to meet the precise needs of the world's finest shooters, and this 40x45 millimeter model is no exception. Its powerful magnification allows you to spot and track your target at extreme distances, and the precision-engineered, multi-coated lenses provide unmatched clarity and contrast so that distant targets appear in perfect detail. The scope features ultra-precise 1/8 MOA windage and elevation adjustments, as well as a side focus parallax system that provides focus for distances from 50 feet to infinity, allowing you to make inch-perfect shots. The scope is made in the United States from premium materials, and comes with a wear-resistant matte black finish. Threaded lens covers protect the optics from damage, and the scope is also compatible with Alumina flip-up lens covers. 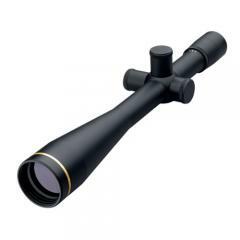 ©2002-2019 CopsPlus.com: Leupold 53436, 53434 Competition Series 40x45mm Riflescope FREE SHIPPING!